Slash Chord Triads - An easy-to-play multi-faceted guitar lesson. Here's a nice easy-to-play but multi-faceted lesson for you. There are several interesting things about this piece that emerged from my guitar the while noodling around with this, but the main one is 'know your triads'. I really really know my triads and they are the basis of my view of the fretboard, as described in my book PlaneTalk, and this little piece is a good way of showing just one little aspect of triads. The other thing to be aware of, and this is more of a listening/hearing thing: slash chords. 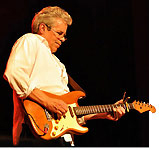 Triads are the smallest chords you can make, namely one each of the three notes required to make chord: the first-third-fifth of their scale. The old 1-3-5. There are four kinds of triads: Major, minor, augmented and diminished, but we're just looking at one flavor here: major. The best way to describe the main theme in this piece is: a harmonized melody line played over an A bass note. I didn't really think of the melody and then harmonize it, though, I just started playing around with the triads of the three primary chords in the key of A. Those chords are the I-IV and V chords of A: A-D-E. I thought to myself "I-V-IV-I" and started playing that progression as triads, but I kept the A bass note ringing under them all instead of their roots, thereby turning the E and D chords into Slash Chords. It sounds like they could really hurt the finger tips, but a slash chord is just a chord with a bass note that's not its root, like "D slash A" ... should really be "D forward slash A", or D/A, or "D over A". The first letter is the chord, the last is the bass note. Back to triads. Each of the four kinds of triad has three 'inversions'. It doesn't matter what order the three notes (1-3-5) come in -- 1-3-5, or 3-5-1, or 5-1-3 -- they're all the same chord. This piece uses all three, and it was by mixing them up that the melody evolved. I wanted to keep repeating the chord progression, and (knowing the melody loves chord tones), I just kept using the appropriate triads to harmonize the whole thing. What? I know ... gobbledygook. In bar 2 I'm using a (from bass up) 5-1-3 for the A chord, a 1-3-5 for the E and a 3-5-1 for the D.
Bar 4 I'm using a 5-1-3 for the A (again), a 3-5-1 for the E, a 5-1-3 for the D and I end on a 1-3-5 for the A chord in bar 5. Bar 6 is a 3-5-1 for the A chord, 5-1-3 for the E and a 5-1-3 for the D (again) ... they're all there and you should (eventually) be able to see them in all their forms everywhere on the fretboard. They stitch it all together, always. After three repeats of the I-V-IV chords played in various positions/inversions over an A bass notes, I go to a real V chord, a dominant E7 for relief from the suspense of those slash chords. You could, if you wanted to, not see them as triads of the IV and V chords over a root of the I chord ... you could see the D/A an "Amaj7add9" if you wanted, and the E as some other sort of A chord ... "Asus4add13", but how much easier is it to simply say "E over A" ... play an E chord with an A bass note. If you think triads, you can see E chords everywhere, they're all over the place, as are the other 11 chords' triads. When you can see them like that, when the fretboard becomes a patchwork quilt of triads, you can experiment with things like slash chords, see the various possibilities knowing what it is you're playing and hearing. This little piece is an example of the I-IV-V chords -- a piece of music's most fundamental structure -- played as triads -- a chord's most fundamental form -- over the root of the I chord -- the most fundamental note in a piece of music. Pretty darned fundamental. It's so important to know what you're playing and to listen to it ... knowing what it is. That may sound like a can of worms but, surprisingly, the more you do it, the more all the strands come together, the easier it all gets to understand, the more you begin to hear what you play and play what you hear. OK, so back to this piece ... after the E7 turnaround, I repeat the whole thing but I add three extra notes in each pass: I add a 1 to the E triad in bar 10, a 3 to the E triad in bar 12 and in bar 14 I use a double stop from the E triad to maintain the timing I have set up. So still chord tones, just notes from the adjacent triad. It's all so simple and logical. I end it on the same E7 turnaround (played properly, this time) with an extra little bit thrown in. There are lots of hammer-ons and slide-ins in these little bass riffs. Use your ear and watch the movie to see how and where they occur as the tab doesn't show which are which. So, there you go ... break it all down, analyze it all, listen. I'm sure all of this stuff is beyond basic to a keyboard player, but guitars keep all this stuff cleverly hidden away in the maze of the fretboard. The timing ... the piece 'feels' the way it does because of the 'anticipations', which are chords or notes played before the beat you'd expect them. For example the D/A chord, bar 2 ... it falls an eight note ahead of the downbeat of the next bar, which is where you'd expect it to fall ... same with the last note of bar 3, the A bass note. That's the root, and you'd expect it to fall on the first beat of bar 4, but it doesn't ... it jumps in on the 'four and' beat of bar 3. I include a midi file with a metronome in the downloadable version of this lesson where you can hear the steady beat underneath the anticipations. Rhythm ... even though I'm not strumming anything you can hear the rhythm coming through my fingertips, not just as the plucks, but also the mutes. I keep bringing my fingertips down on the triad I just plucked. Not only does the ringing stop, which is enough to set up a rhythm, but there's a little clicking sound that acts like a percussion instrument. Notice I don't do it all the time ... light and shade. Look out for choking off the A bass note each time ... the 'slash chord' quality only exists if that bass note is allowed to ring under the triad. It's so easy to come down with the three-finger triad shape and hit that A string on the way through, choking off the bass note. Be conscious of that for a few passes, it will soon become habit. That recurring bass thing that keeps happening ... notice that they're not all the same. More light and shade ... come up with some of your own. Those little bass riffs keep re-setting the feel, keep bring the ear back to underlying pulse. All played by the thumb, of course. Don't try to duplicate that weird thing that I played at bar 8, it's a flub, an interesting one, but a flub nonetheless. My fingernail snagged the B string or something. I suggest you go looking for triads in other places to add to this theme; there's a whole fretboard there to be mapped out and tested for sound, musicality, comfort of playing ... and experiment with slash chords. Twang a low note and whack some foreign triads over it. The ones I played here are the most fundamental (there's that word again) but there are many flavors. 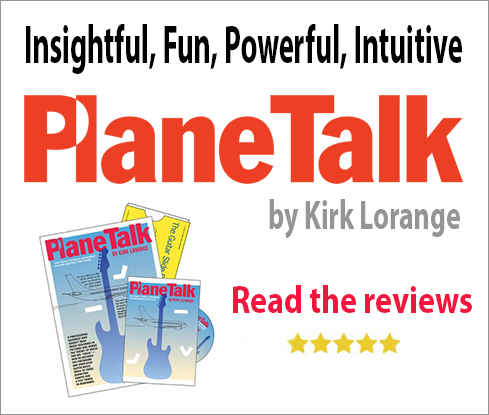 And if you want to shorten the learning curve where triads and mapping out your fretboard are concerned, order my book/DVD PlaneTalk. You'll save yourself 15 years of hair pulling.